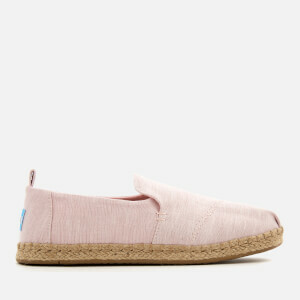 Women's 'Alpargata' deconstructed chambray espadrilles from TOMS. Crafted with a slub chambray canvas upper, the pumps showcase a slip-on design with the brand's signature stitched toe and tonal zigzag seam detailing to the vamp. Set on a jute rope-wrapped sole with blanket stitching. Complete with a removable cushioned insole, a heel pull loop and the TOMS flag logo. I fell in love with my first pair of Toms espadrilles and have bought a few now. Love the colour of these.